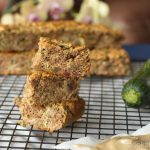 A healthy, Paleo-friendly zucchini tahini slice with a unique nutty taste and texture – a winner all round! Ever thought of combining zucchini with tahini? I hadn’t either, until I saw a post on Instagram, where Taylor from Food Faith Fitness (original recipe here) posted some zucchini low carb muffins with tahini. 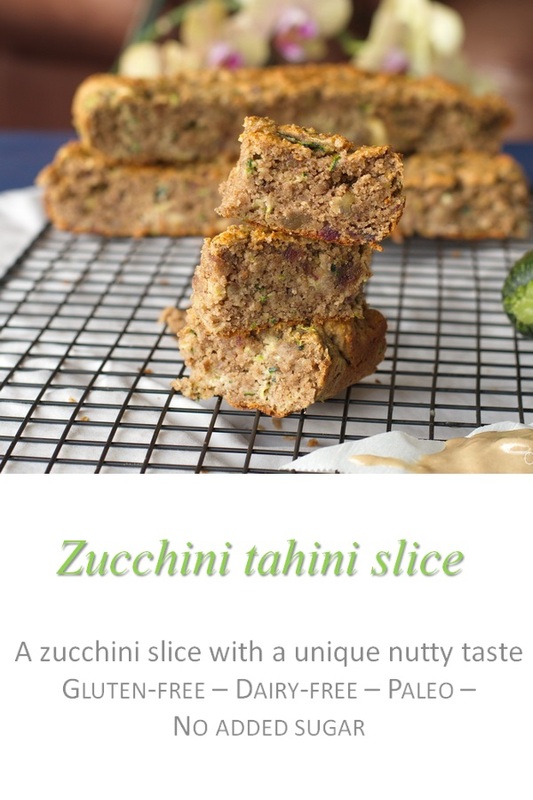 Sneaking in the zucchini for veggies, and tahini for the nutty taste, I was sold. The original recipe called for Monk fruit sweetener, which I had never heard of or used, so I thought I’d try something different, making it into a slice and topping it with my famous healthy date frosting, or my chocolate avocado frosting. In my recent quest to remove all added sugar from my baked goods, I tried using some Medjool dates instead. And in my awesome Ninja food processor (get yours here), this slice comes together in one fell swoop … Basically just add the wet ingredients in first, then the dry and blend together. 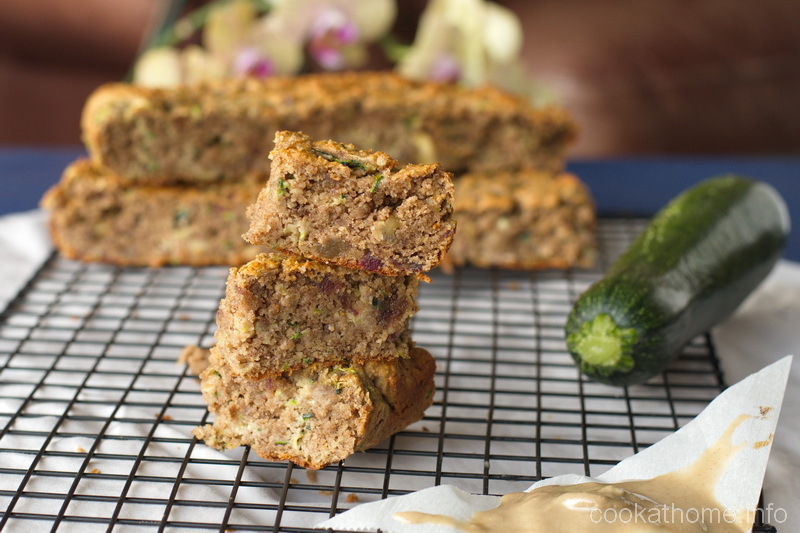 Fold in the zucchini and walnuts, bake and top with the frosting (optional) and you’ve got a slice that’s healthy enough for breakfast, and yummy enough to have all throughout the day. Preheat oven to 350F and prepare a 9x9" baking dish with parchment paper. Place the dates, eggs, tahini, almond milk and vanilla extract in a food processor and blend until well combined. Add the almond meal, cinnamon, allspice, baking powder and baking soda to the processor and mix until just combined. Move to a separate bowl and fold in the grated zucchini and walnuts until well dispersed. Pour into baking pan and smooth into corners and on top. Bake for 20-25 minutes or until a toothpick inserted in the center comes out clean. Let cool in the pan for 10 minutes then transfer to a wire rack to cool completely. Frost with a healthy cashew/date frosting, or chocolate/avocado frosting. Can also substitute dairy-free chocolate chips for the walnuts if desired.